Spoiled with choices. This is one of the weekends where there were too much races going on for both Saturday and Sunday. 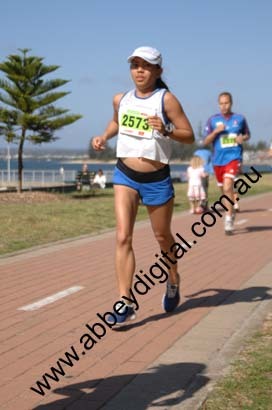 There was Sri Chinmoy Iron Cove, Brighton Beachdash, SMC Series and the Strider’s 10 KM series. It was hard to choose , I did want to do a longer run that Sunday, but a Half Marathon at SMC is too long for me, Sri Chinmoy at Iron Cove would be perfect for the 16KM, however, I always do run around the bay I think I’m bit over it, although I’ve ran the 1st Series on same distance in slower time two years ago, I wasn’t challenged and convinced to do the run, although it is very convinient 5 minutes drive to the start. So what’s left is the Brighton Beachside Dash. I have done the 10KMs twice and did quicker time too due to the flat course. But it is 10KM and a 5KM. Decided to do the Beachside dash anyway. Looked at the website and the 10KM race starts 800am and the 5KM starts at 9:30am. I ws thinking, If I finish within an hour, I still can run the 15KM and that would make up my longish run. That is, If I am not that spent, if I am, I prolly take some kilometers by my own on the area and do the distance and less pressure on the speed. Come what may. I arrived at the venue early and had enough time no rush to the toilets, do my warm ups and stretches. 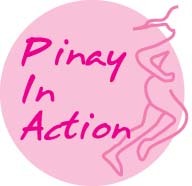 I just registered for the 10KM for the moment. I saw fellow Woodies Bridget and Emma. had a little bit of chat, ,stretching and we headed to the start. 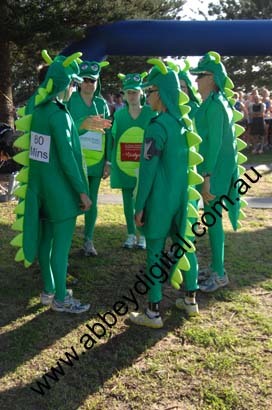 They would like to chase the 55 min “dragon” (pacers were dressed as St. George Dragons). I do not know what time I’d do with the course, I know it is flat and would be happy if I beat my own course record, but I thought, under 50 minutes will be good. So I need to be just ahead of the 50 min dragon. The 10KM Race: While waiting for the gun, the organizers explained that the course has changed a bit. 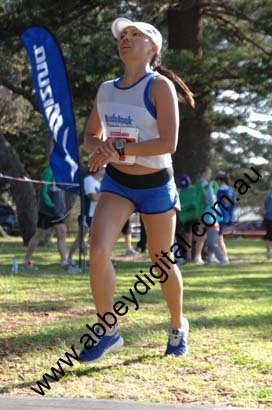 I have heard from the last races I’ve done with them, some runners think the course was shorter than 10KM. So this year, looks like they took action and did their best in terms accuracy. The day was perfect, sunny and bit of breeze coming from the bay, which Im bit worried that could be difficult coming back on the turnaround for the 2nd half of the distance. Hoping that it does not go very hot too. I’ll be fine, told myself. No pressure. I’ll just run the best I can and have fun. So the gun went off. 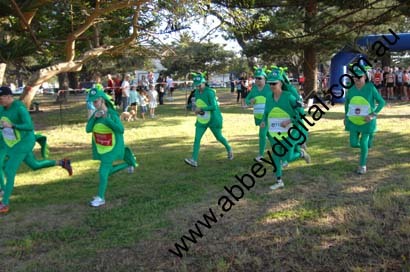 I was bit just before the middle of the pack but still at the back of the quicker runners. The other year, it was just bit crowded that we had to do walk before the crowd dispersed. So this time I knew I shouldn’t be in the middle but just before them if I did want to avoid the roadblock. So that ws better, no walking this time and started running. Catch my bus was my goal. The dragons were set off a minute before us. So while looking for my dragon, I was going just under 5min/KM and I’m bit feeling tired already at 2KM. And I have not found my dragon. yet. I think the dragons were running bit quick. At last found and overtook 60 mins dragon, I can see from hundered meters another dragon. I bet this is 55 mins. I was having problems catching him too, i did try to speed up a little more, and caught him just before the water stop. At last I told myself. The day was getting warmer. So I thought it is wise to drink water at the stop which is the 2.5 Km marker where the 5KM runners turnaround. Finding my 50min Dragon!The temperature is definitely getting warmer and warmer. 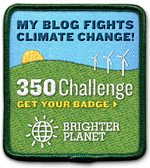 And I was regretting, why I did not drink more on the water station or why is there not more water stations. So All I can do is Harden up and Run! I knew I slowed down and glad to reach the turn around point. At this point I havent seend the 50min dragon yet. Where the hell this dragon is. I must be going that slow over 5 min a K. Then here it is the head winds from the bay, 5KMs of it blowing warm breeze. I am thirsty and can’t wait till I get to the 7.5 Km mark for that water and I swear I am going to take a walk! Which I did. I already let go the female competitors theyy went ahad, theay were stronger and quicker. I will just have to finish this with my best. Got to the water stop, walked, grabbed two cups, poured oneon myself and drank the other slowly. 2.5 more kilometers that’s around 12 more minutes. I took my mind off the race and just enjoyed the view and the breeze, come what may. Breaking my course record seem to be impossible at this moment. I can see the finish area half a kilometer away from me, so near yet so far away! 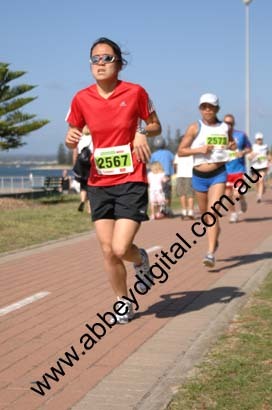 10Km Finish. Near the chute, tried to sprint, can’t and tried all I can give. Finished 47:58, that is 1 second slower than 2 years ago. But then come to think, the organizers fixed the course to a more accurate distance, there was a headwind coming in back the finish and i remember this day is warmer. Could be slower, so I am happy with that. At the finish, we were given headphones for free :). Bit of energy left! I was bit spent and waited for the girls to come back, as Emma came next after Bridget in few seconds in between. I wasn’t sure and was still toying with the idea of running the 5KM or do on my own. While we were chatting I saw few peopld doing the 5KM so I thought, this might not be bad. 25 mins more running, more mileage for the week (25 bux poorer!!). The girls decided to go for a breakfast and I told them I will join the 5Km having 5 mins in my hands before the gun start, and I will just follow them if I oulled out alright. 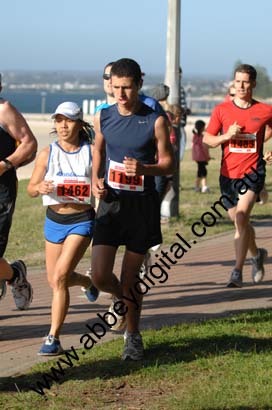 5Km Race: Got back into the car got registration money, jogged to the rego boot,, ,quickly pinned my bib and jogged to the start and they just fired the gun and I reached the back of the pack! Tried to get away from the walkers and got into a rythm easy 5KM run, without pressure as I am just doing this for mileage. I already knew the conditions out there so I know what I should be prepared of. I was anticipating the heat, the water the wind and the clippers on the path. Number of ladies running it. Was able to over take 2 female runners and is just behind one strong one. I told myself to just hang on and stay with her. At the turn around she seem to have slowed down so I said hi and check if she’s alright she says she is so I went ahead. Next female runner is far away, I know I won’t get her. Few blokes on the same pace overtaking me everynow and again. Funny how psyched I am and the head winds did not even bother me. The 5KM seem to have gone quicker than I thought and I am almost back at the finish. Ran as quick as I could, finished at 23:21. That wasn’t bad at all! I am glad to do both races, happy with the times, mileage accomplished. Way to start the week! All profits from the race will fund vital medical research into trauma and emergency care. Good for you. Nice to see you posting again.